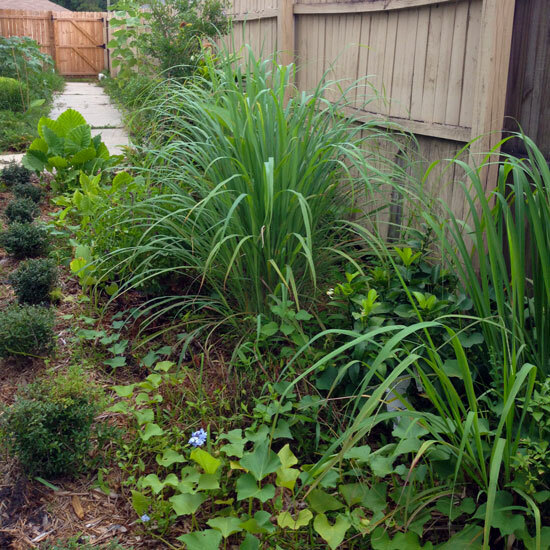 No space is too small to grow your own Southeast Asian ingredients. Instructions here. 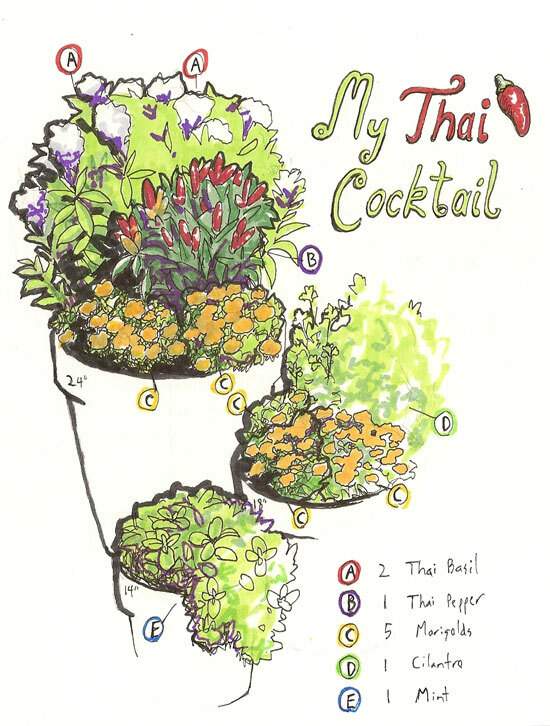 I've loved Thai food long before becoming a gardener, and it eventually found its way into the garden as well. Now I can look out my window to see a whole garden bed of lemongrass, turmeric, ginger, Thai basil, sweet potatoes, bananas and Thai peppers, and as you can see in the below photo, these edibles look just as good as they taste. 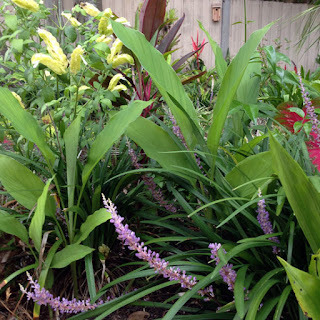 Southeast Asian ornamentals and edibles combine with Florida natives in my garden. Believe it or not, most of the plants on this list can be grown throughout the United States during the frost-free part of the year. 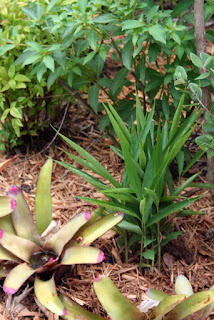 Sure, it is a bit easier to grow them in my zone 9a climate of Jacksonville, Florida since I have a longer growing season, and can grow some plants in the ground year round, but most of the vegetables, herbs and fruits I’ve listed here can be grown in any climate by one of three methods, depending on the plant. Plants like turmeric, arrowroot and ginger can be dug up before the first frost and stored indoors over winter as you would store bulbs. Collect seeds from annuals and tender perennials like Thai Basil or spearmint and replant the seeds in spring. Any other frost-tender plants, such as starfruit or limes, can be grown in containers and brought indoors for the winter. 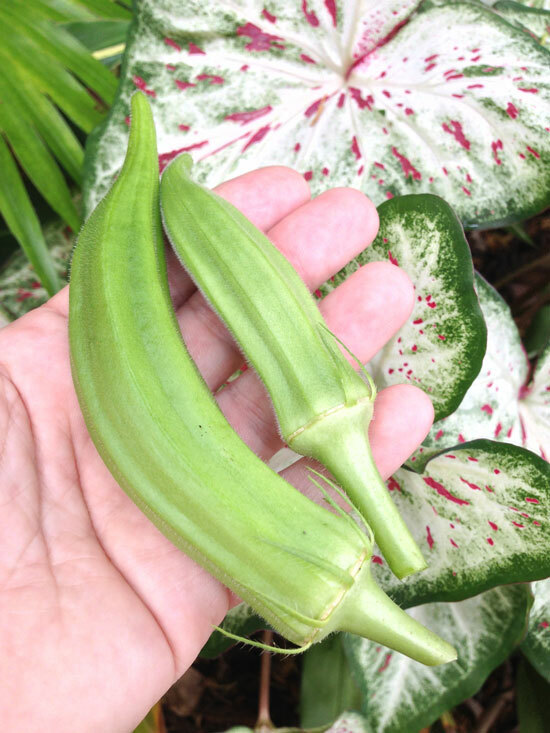 Okra – Great sautéed or used as a thickener in soups, okra is one of the easiest plants you'll grow in the summer garden, provided its main requirement is easily met. Just pick the pods before they turn woody so that the plant keeps producing until frost. In case you still need to be convinced of its versatility, here are five unusual ways to put your okra to good use. Grow it in the back of the border to take advantage of the height and enormous leaves, or plant it close to a walkway so that you can easily pick pods every day or so. If you want enough okra to eat every day, I recommend growing at least ten plants at a time. If you have extra, they’re easily frozen for later use. 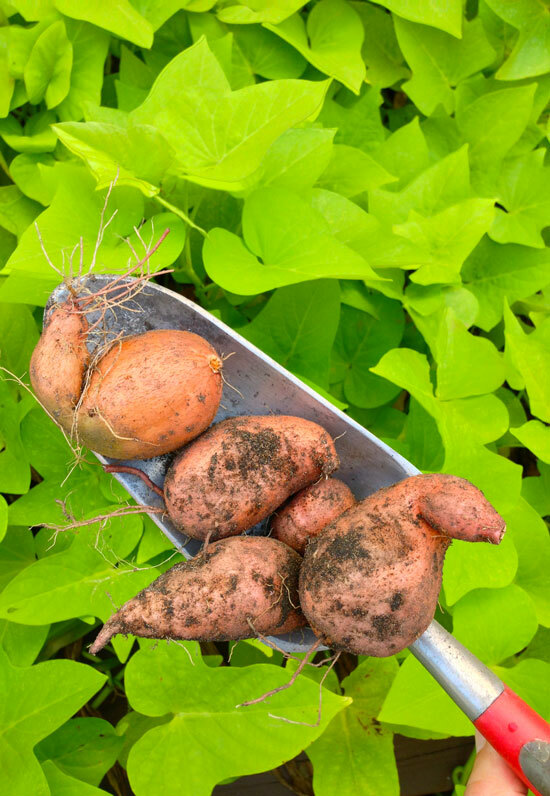 Sweet Potato – They’re not just for Thanksgiving anymore, and are useful in curries, soups or simply roasted as-is. In the Philippines, even the leaves are eaten! They’re also yet another plant that I would grow for looks alone since they cover a lot of ground with lush greenery in even the hottest of summers, and when the foliage starts to decline you'll be surprised by the sheer volume of food beneath the soil's surface. Here in zone 9a I’ve even found that they’re perennial and will return the following year. If possible, look for white-fleshed types that won't overpower your presentation. Arrowroot - It might not be a proper Thai ingredient, but is a gluten free starch that you can experiment with in your recipes. More of a starchy thickener than a proper vegetable, this prayer plant relative is easily grown from roots and overwintered as a bulb. The variegated form is a common houseplant, but the non-variegated form can be used to make arrowroot powder. Dark green leaves reminiscent of a ginger plant's emerge when the summer heat arrives, followed months after by delicate little white flowers. When the days have become consistently warm, plant the roots in either full sun or part shade, with the narrow end pointing downward and the top end just an inch below the soil, and wait about a month to find leaves emerge! Luffa - Those funny sponges you'd shower with in college while listening to Dave Matthews Band are also an edible vegetable! 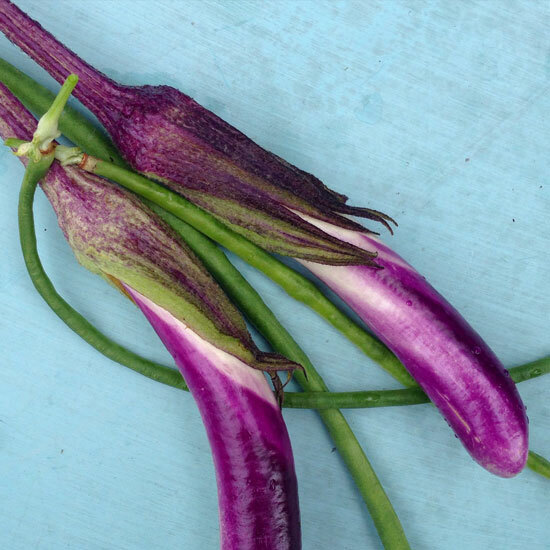 When the fruits are immature and tender, they’re harvested and used in stir-fries much as you’d use okra. Luffa requires a longer growing season than most gourds and the seeds need heat to germinate and grow well, so don’t attempt them any further north than zone 7 unless you have a warm greenhouse. The vines can be grown on a trellis but are most impressive when the fruits are hanging down from an arbor. Of course, if you let the luffa gourds mature too long on the vine, you can always use them as loofah sponges. Thai Peppers – Ever notice how food from Vietnam, Thailand, South China, etc. is always so spicy? You have peppers like these to thank. 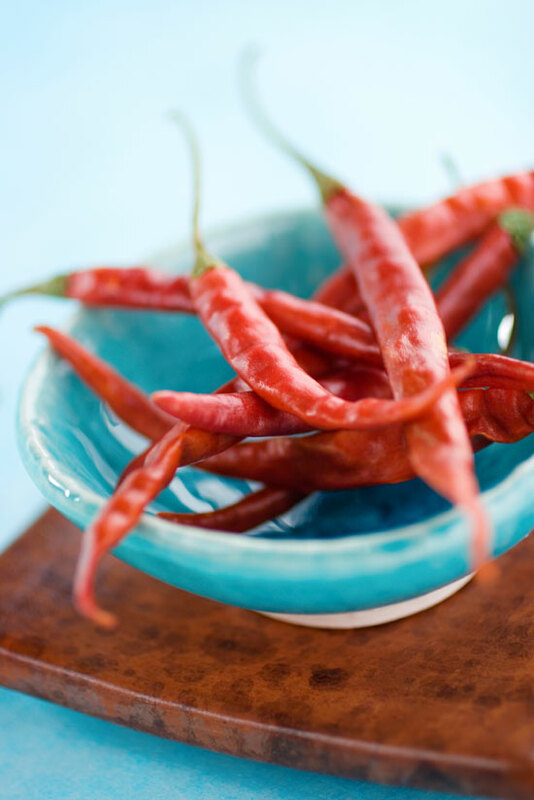 Birds eye chilies and finger-length Thai chilies are both very hot, so be sure to use them in moderation until you've found the right amount of eye-watering spiciness you're after. Seeds can be ordered through most catalogs and seed websites, and you might even find plants at the garden center. These are heat-tolerant plants that can be grown right through a blazing South Florida summer. Yard Long Beans - Thanks to their heat-tolerance and prolific crop of aptly named yard long beans, you'll hardly find a better bean to grow in hot summers. They’re really yummy in stir-fries, curries, eaten raw in salads or just eaten on their own. While the pods can grow to become a yard in length, many will need to be harvested at shorter lengths before the beans inside develop and the pods turn tough. A good rule of thumb is to pick them before they approach a pencil’s width. Thai Eggplant - Thai eggplants are usually round, sometimes elongated, and always drop dead gorgeous. I mean, these are seriously pretty eggplants regardless of what you plan on cooking, whether it’s a stir-fry or curry, or even raw on their own. Grow Thai eggplants in summer, provide plenty of water for the best growth and harvest fruits before they take on a dull finish. 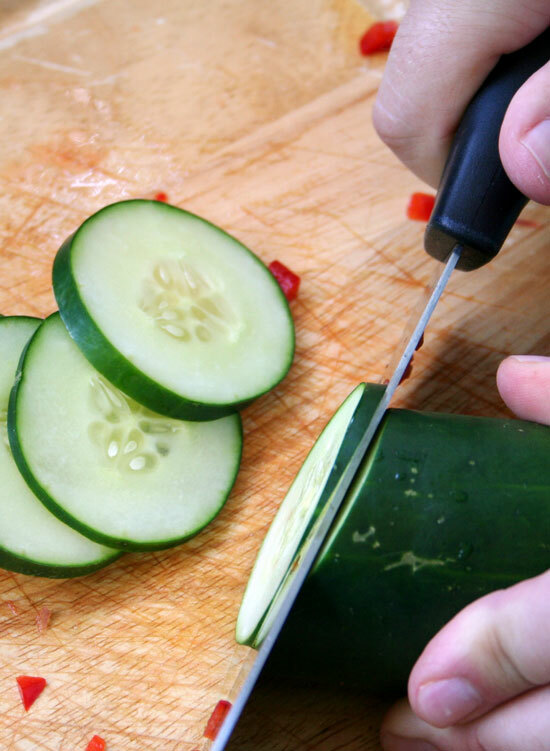 Cucumber – I used to hate cucumber, but then I had it at a Vietnamese restaurant as a salad with rice wine vinegar, chili peppers, fish sauce and a touch of sugar; and then decided that I was just eating them wrong all along. Petch Tsai is a pretty Thai heirloom you can order online, but any cucumber will do just fine in a recipe that calls for cucumbers. Here in Florida I have to grow cucumbers in spring or fall, but in cooler areas they can be grown in summer. Cucumbers are honestly quite a pain to grow since they’re susceptible to a host of pests and diseases, but I think that they’re worth it. Just grow them on a support and keep the foliage dry. Some Thai flavors remain elusive to the average gardener, whether it's the distinctive tanginess of the Makrut lime's leaves, or the delicate notes of rice paddy herb. Still, most are easy for anyone to find in either the garden center or seed catalog. Some are truthfully a little more difficult, but others are common herbs that you might already be growing. Turmeric - This is the ginger relative that lends its yellow hue and warm flavor to curries and satays. 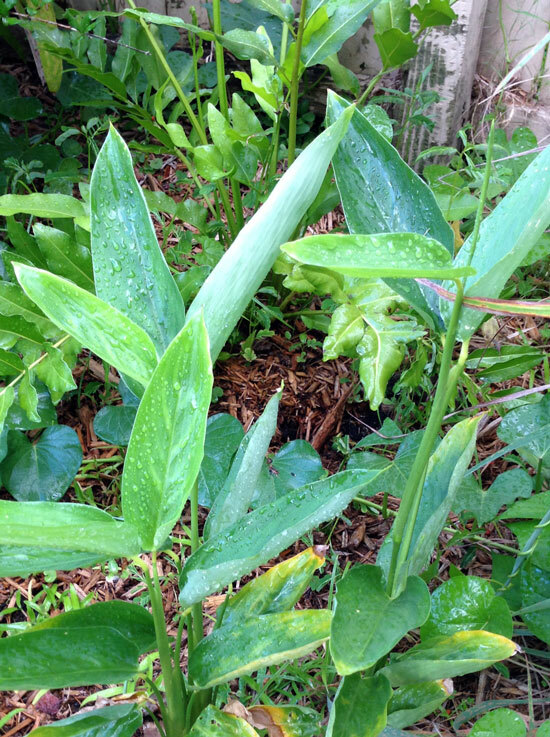 The foliage of the turmeric plant is similar to that of a canna, and I would personally grow the plant for looks alone. Purchase roots from the grocery store (organic will sprout better) and plant according to these instructions. Here’s how prolific the stuff is: I started with a single little rhizome from the grocery store last year and have about 10-15 plants in my garden right now, from that one little root. Whenever I dig the rhizomes up to divide and store for winter, I always manage to miss a piece and find it re-sprouting the following year in the same spot. Ginger - Few herbs are used as much in Southeast Asian cuisine as ginger, though I suspect that the real reason is that recipes must call for ginger because they rightly assume that home cooks can’t find galangal or krachai at their local grocery store. Like turmeric, you can sprout the roots from the produce aisle, and I even wrote a blog post on that too! I don't find it nearly as vigorous in the garden as turmeric, but perhaps it’s unfair to compare the two. 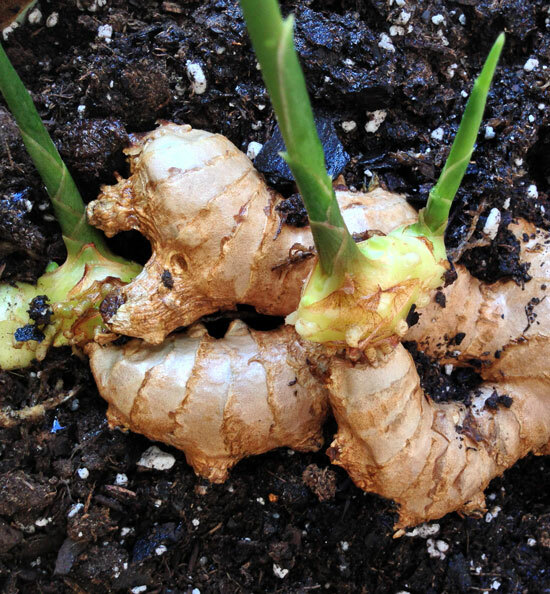 Galangal - You'll see this ginger relative called for in many curry recipes, but the only surefire way to make sure you have it on hand is to grow your own. 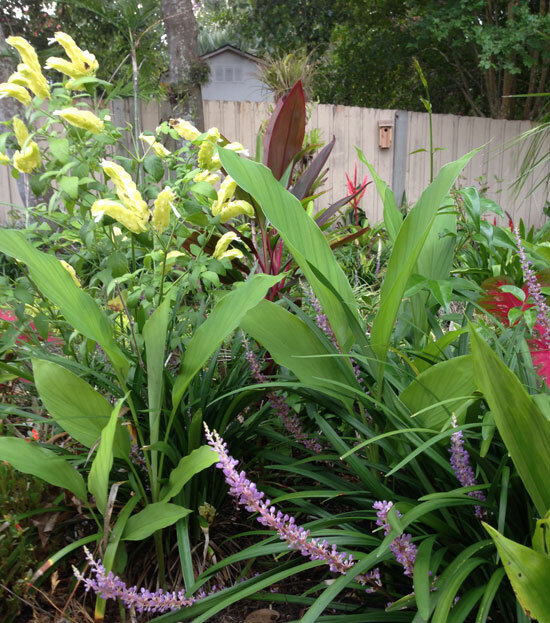 The foliage is attractive; like that of ordinary ginger but with wider, densely arranged leaves. There are two types of galangal: Greater galangal (Alpinia galanga) is harder to grow outside the tropics, but lesser galangal (Alpinia officinarum) is easily grown in containers or outdoors in zones 9-11. 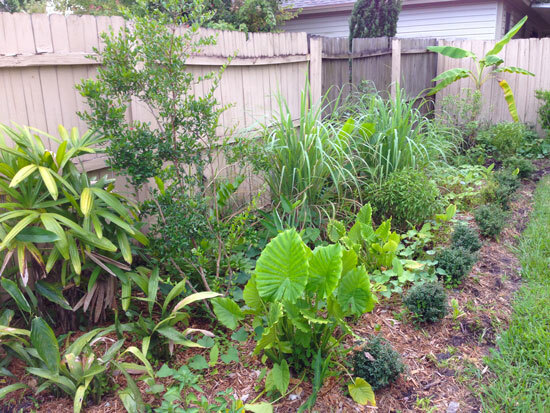 I grew lesser galangal at my mother's house (pictured) several years ago but still need to buy one for my current garden. Makrut Lime - It's also known as Kaffir lime, but I don't like that name as much and will opt for the Thai name of 'Makrut' instead. Mm'kay? Anyways, the leaves are sliced finely and used in soups and curries, lending a tangy note to spicy dishes. 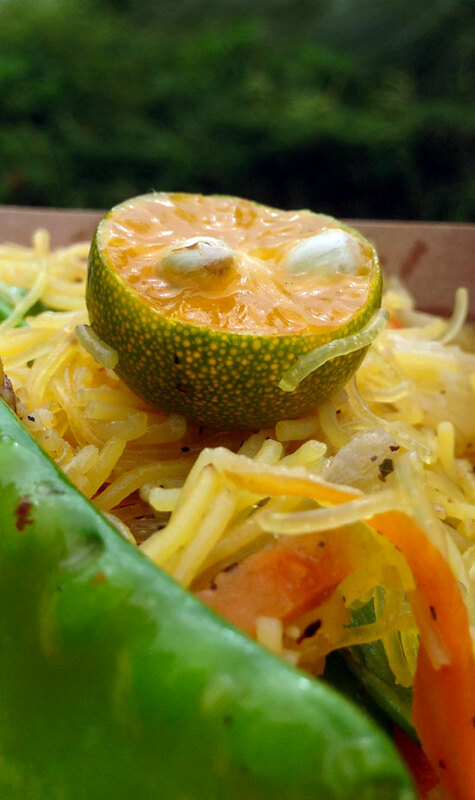 The zest of the bumpy little 'limes' are added to curry pastes. These citrus bushes are very tender to cold but are easily grown in containers and brought indoors to a sunny room during winter. Since you're growing makrut lime for its leaves in all likelihood, use a fertilizer that's high in nitrogen. Harvest by snipping off just half of the segmented compound leaf. 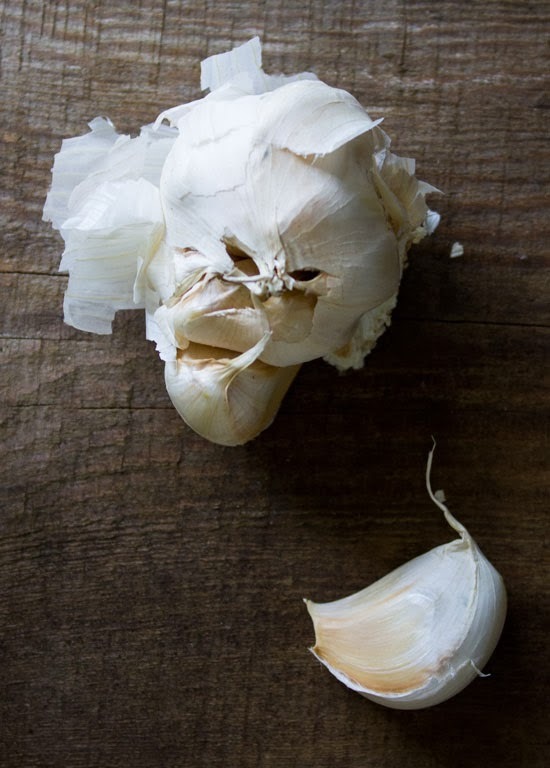 Garlic - If you've ever had sriracha sauce, you know how nicely garlic pairs with chili peppers. I use the stuff in almost all of my dishes, unless the flavor just doesn't work. But whenever cilantro, soy, chili peppers and ginger are in the mix, I'm sure to toss a minced clove in for good measure. Unless you live in an exceptionally cold climate, plant garlic in fall and harvest later in the year when the tops turn yellow and flop over. Then hang them out to dry for 3-4 weeks in a cool, dark place (or wherever vampires lurk). You can either purchase heirloom varieties, or you can grow the organic garlic you find in the produce aisle. One more thing: Fry minced garlic in a little bit of oil and use it as a condiment. It’s amazing. Lemongrass - Use a bundle of lemongrass leaves to flavor soups or make a tasty tea, or chop up the white interior of the stalk for curries and other dishes. You will scarcely find an easier herb than lemongrass, provided you plant it out in spring and harvest before the first frost. In my own (USDA zone 9a) garden I'm able to leave it in the ground, but it's also easy to grow in a container and overwinter indoors. Lemongrass likes moist soil and full sun, though it will still get by through drought or a little shade. For more info, read my earlier article on how to grow lemongrass. Krachai - Finger-like rhizomes have given this exotic herb the nickname 'fingerroot', and is useful in Thai cooking, either raw, pickled or added to curries, or as a medicinal plant. I’ve never had it, nor grown it, but I hope to do one of those two things in the near future. It is reportedly hardy from zones 8-11 and requires moist soil and full to part shade. Spearmint – I always thought that spearmint was just the flavor of gum that I accidentally buy sometimes when I mean to get the peppermint flavor, but it just so turns out that the flavor works well in tandem with other ingredients in salads, sauces and curries, adding a much needed cooling note. If you grow this yourself, be sure to never plant it in the ground as it will spread and is difficult to eliminate. That said, I have done just that in the hopes that it will just crowd out inedible and useless weeds. You can grow it from seeds, or you can just place cut stems in water and transplant to a pot once the roots form. Pandan – Like krachai, pandan is another ingredient on my list of things to experience in my garden and kitchen. It is useful in baked goods and adds a sweet fragrance when added to dishes or used as a wrapping. The plant itself is a member of the screwpine genus (Pandanus) and it can be grown in a container… but it needs heat and humidity to thrive. Rau Ram - Polygonum odoratum is also called Vietnamese mint and Vietnamese cilantro, but whatever you call laksa leaf (another one of its names) be sure to let me know all about your experiences growing it. I have yet to grow daun keson (yet another of its names) but will soon be trying it in the shade of my lemongrass and bananas. Apparently they like part shade and moisture but resent temperatures below freezing. Oh, and it's actually called Persicaria odorata and Polygonium odoratum is now a synonym. I think I'll just call it rau ram. Cilantro - Whether you love or hate the distinctive soapy taste of cilantro, it's essential in many Southeast Asian recipes when used in moderation. Even my cilantro-hating wife doesn't notice its inclusion in my stir-fries when I balance it out with other strong flavors. My one beef with cilantro is that it bolts easily here in my Florida heat, so I have to grow it in winter. Luckily it grows quickly from seed. Siam Queen is an exceptional selection of Thai basil. 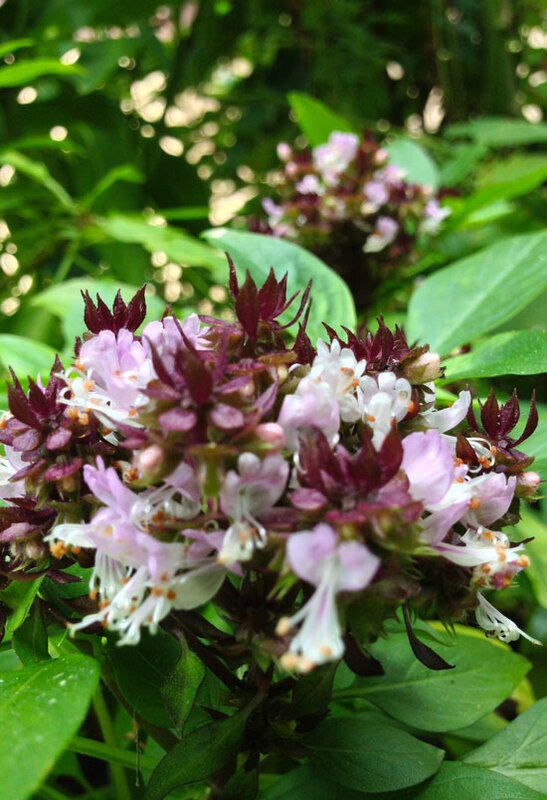 Thai Basil - Densely packed little leaves and inflorescences of purple flowers on a compact and bushy plant make this basil loads more attractive than the sweet basil one would normally grow. But then there's the flavor - just like ordinary basil but with a wallop of licorice and anise bite. Okay, it's totally different. Grow it in full sun with average moisture, and be sure to get an extra plant so that you can harvest from one and enjoy flowers from the other. 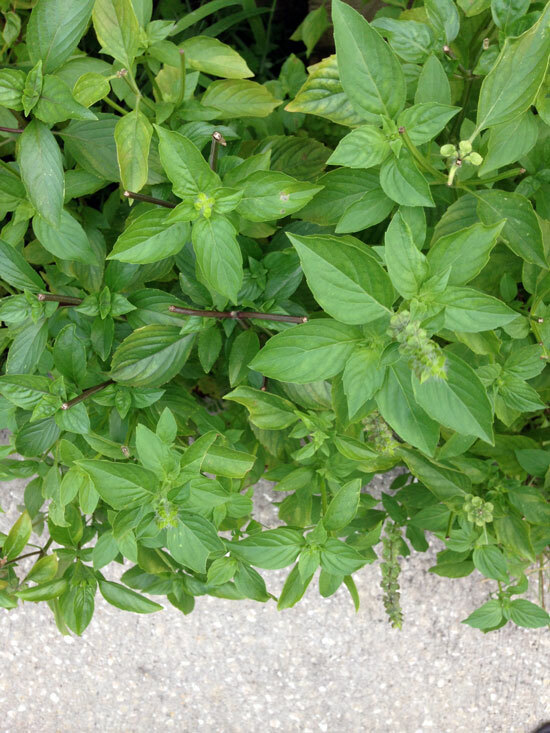 Holy basil is another type that’s often called for in Southeast Asian recipes. Here I've planted cinnamon basil and lemon basil together along my path. Laos (Lemon) Basil - This herb smells and tastes absolutely heavenly. I mean, I eat leaves right off the plant they're so good! It’s especially utilized in Laotian recipes, but I use it in any way I can. The seeds are soaked in water and used in desserts. Haven’t tried that yet, but it’s on my to-do list. See ‘Thai Basil’ (above) for growing tips. 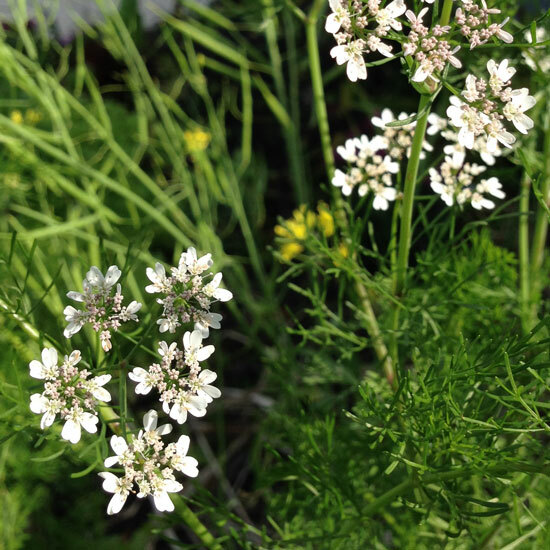 Culantro – It sounds like cilantro, but has a much stronger and earthier flavor. The sawtoothed leaves of this herb are used in larp and other beef dishes, and are often served with other herbs as a condiment. Since it grows well in shade and bolts in full sun, grow it in the understory of other edibles on this list. Harvest the leaves as needed. Rice Paddy Herb – Delicate and fragrant, this Vietnamese herb is added to soups and fish dishes at the end of cooking or added fresh at the table. I’ve never grown it myself, but found a unique and effective way to grow rice paddy herb in containers; by wrapping in a plastic bag with holes poked for ventilation. 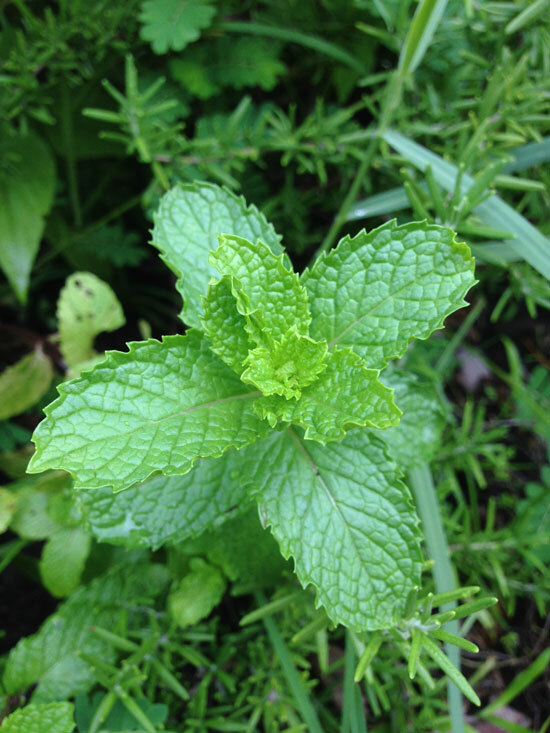 Vietnamese Balm – Like a stronger version of lemon balm, kinh gioi offers a lemony flavor to fish dishes and soups, whether fresh or cooked. You can grow it from seed via a specialty website or catalog, or from cuttings. Most fruits used in Southeast Asian cuisine are too cold-tender for anyone outside the tropics, there are some hardy exceptions, as well as fruits that can be grown in pots. Roselle - It's not technically a fruit, but is used as such. If you've ever had hibiscus tea, you're already acquainted with the tangy zing of this hibiscus relative. Think of it as a cranberry you can grow in your own backyard, and on an imposing plant with deep green palmate leaves and red stems. 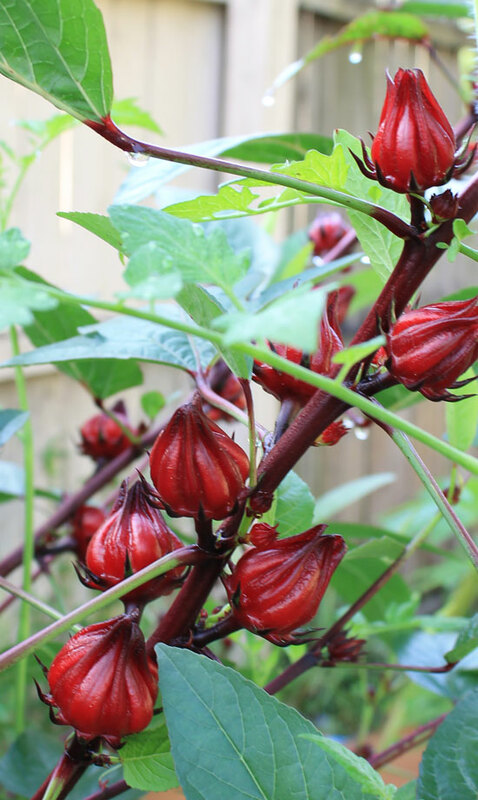 And then imagine that plant with peachy hibiscus flowers, and you have roselle. I use it to make Jamaican sorrel tea, or I just eat the candylike 'petals' off the plant. Pomelo - A huge citrus fruit with a thick rind and tiny segments of juice that break apart, perfect for sprinkling on salads. I won't say that pomelos are like grapefruit, because grapefruit is disgusting. In that respect, pomelo is nothing like grapefruit because it's actually tasty. Grow pomelo in zones 9b-11, or grow it in zone 9a and protect it in winter. If your little tree fruits, remove all but one pomelo so that it doesn't get pummelled under its own weight. See what I did there? Calamondin, or kalamansi, is a lime alternative that tastes great with pancit, a Filipino dish. Lime – This is the best way to add tartness to balance out other strong flavors, so it’s common in many recipes. Limes are the most tropical of the citrus fruits, so unless you live in zone 10, be prepared to grow it in a container on a dwarfing rootstock. Suitable substitutes include kumquats and calamondins (kalamansi), the latter being a very important part of Filipino cuisine. I prefer it to lime, actually. Both are easy to grow in pots and are hardy outdoors in zones 8-11. You know what a banana looks like. 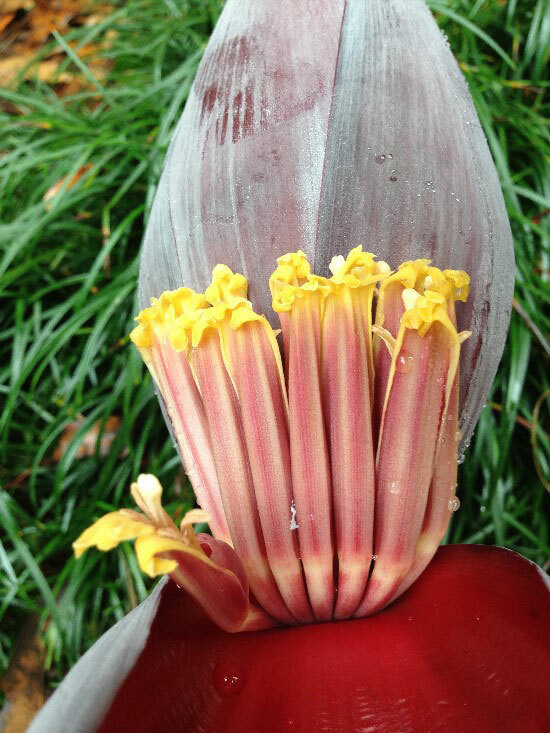 Here's a banana flower inflorescence, which is also edible. Banana - If you live in zones 8-11, you have to grow bananas. The leaves can be softened in warm water and used to wrap foods for steaming and grilling. The heart of the banana's flower inflorescence is used as a vegetable in salads and other dishes. And then there's the fruit, delectable when ripe and just as good when cooked green and unripe. There are hundreds of banana cultivars grown in Thailand, but if you live in zones 7-9 your best bets are freeze-resistant types like ‘Ice Cream’ ‘Orinoco’ and ‘Rajapuri’. Jujube - 'Jujube' sounds like something nasty you'd hear an old prospector ask of a working woman in a saloon. I saw it in a western novel once... don't ask. The first time I tried jujube, it was in the backyard of a generous Cambodian woman who enthusiastically insisted I bite into the unripe and slightly astringent fruit for myself. It was good! The plant itself is thorny and ornery as a mule carrying a... sorry. Got all 'westerny' again. Anyways, it's a thorny bush/tree that's hardy from zones 6-11. 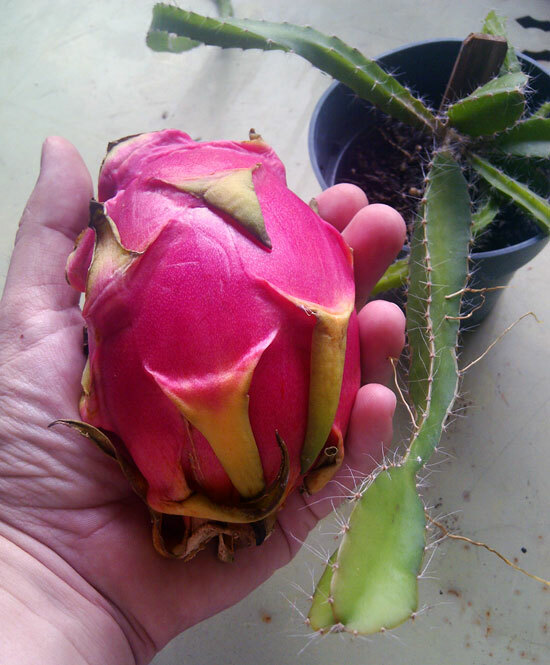 Dragonfruit - The same Cambodian woman who let me sample a jujube also grew dragonfruit. Now dragonfruit is a tropical vining cactus that doesn't like frost, but she had the ingenuity to construct a trellis over the driveway that was wrapped with Christmas lights and covered with plastic tarps during freeze and frost warnings. I grew them from seed several years ago and still have a few plants growing in empty pots that I've pretty much abandoned. Their resilience is uncanny, but I should still do them a favor and properly pot them up soon. My point is that they're incredibly easy to grow. Here's an earlier post that I wrote on how to grow dragonfruit from seed, along with other growing tips. Starfruit – Though not exactly a huge part of Southeast Asian cuisine, it’s still worth mentioning since it can be grown in pots or from zones 9b-11 in Florida. This is that weird translucent fruit that you sometimes find at the grocery store, and it’s useful when green and unripe as an acidic ingredient to replace blimbi, tamarind or lime. I’ve grown it from seed and the plant has survived 20 degrees of cold for at least a few years, but it’s still pretty small. It can be grown in a pot and brought indoors during winter, but unless you’re in it for the interesting appearance of the fruit (looks pretty cool when sliced as stars and plated as a garnish), citrus would be easier and more useful. I love this fruit so much, I drew it one day for the heck of it. Passionfruit - Popular for drinks and desserts in Asia, passionfruit is cold tender and has to be grown in a container and brought in during winter. Hard purple skins reveal a tantalizing tart interior with crunchy edible seeds encased in a goopy mess of juice. All in all, it's probably my favorite fruit. 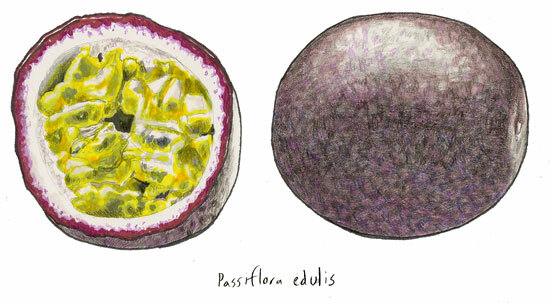 Here's how to grow your own passionfruit from seed. In case you're interested in growing some of the more tropical fruits, here are five great dessert fruits along with a bunch of other unusual fruits that have to be seen and eaten to be believed. Okay, so maybe there were more than thirty ingredients in there, and there are many more that weren't even mentioned. If you have any experiences you'd like to share regarding cooking or growing Southeast Asian food, please share! Thanks for this! I'm going to be moving to Naples, and wanted to put together the Thai equivalent of a French kitchen garden. This is very helpful.